What defines a succulent or a cactus? Succulents: Succulents are water-retaining plants adapted to arid climates or soil conditions. Succulent plants store water in their leaves, stems, and roots. Cacti: Cacti are plants of one family, the Cactaceae. They are any of various succulent, spiny, usually leafless plants found mostly in arid, but also tropical regions. Exclusively new world plants, they range from South America to parts of Utah and Colorado. Echinopsis is a large genus of cacti native to South America, sometimes known as hedgehog cactus, sea-urchin cactus, or Easter lily cactus. One small species, Echinopsis chamaecereus, is known as the peanut cactus. The 128 species range from large and tree-like types to small globose cacti. 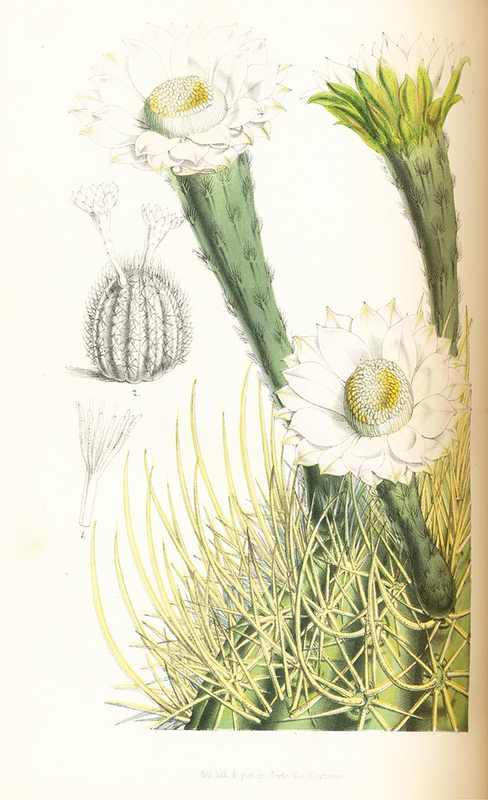 The name Echinopsis derives from echinus in Latin, meaning hedgehog or sea urchin, and opsis appearance, a reference to these plants’ dense coverings of spines. Echinopsis campylacantha. Image source: Flore des Serres et des Jardins de l’Europe (‘Flowers of the Greenhouses and Gardens of Europe’) (1845-1888) Tome 6 (Vol 6). See plant location for Echinopsis hybrid in the garden using Google Maps. The only cactus genus that is more confusing than Echinopsis is that of Opuntia. As a result, there is a long list of synonymous names for many of the species. Some synonyms refer to other synonyms, which in turn refer to a subspecies of some seemingly distinct species. Echinopsis campylacantha is a synonym of Echinopsis leucantha (Gillies ex Salm-Dyck) Walp. The bulk of plants referred to as Echinopsis are mostly spiny, ribbed, globose plants; and the main factor that ties these plants together is their very large, showy flowers. The funnel-shaped flowers, with their hairy-wooly-scaled floral tubes, give rise to hairy, globular fruit filled with a soft, mushy pulp. The flowers seldom last more than a single day and may be diurnal or nocturnal depending on the species. Echinopsis campylacantha or Echinopsis leucantha is round, deeply lobed, with long curved dark pink and gray spines and originates in western Argentina. Aloe brevifolia, known commonly as “short leaf aloe”, is a stemless perennial succulent that is native to South Africa. Triangular-lanceolate leaves are in tight rosettes up to 6 inches tall. Individual leaves are 3 inches long by 1 inch wide. Leaves are flat on top and concave on the underside and are armed with white teeth along the margins and keel. The plant freely produces offsets and can form large clumps. Spikes of orange-scarlet flowers appear in late spring. Aloe brevifolia. 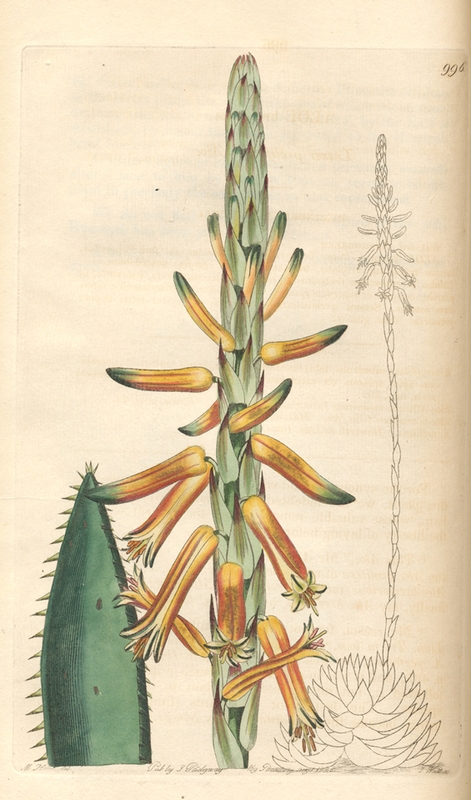 Image source: Botanical Register Vol. XII (12: plate 996. 1826). Many people confuse agaves with aloes. Both are succulent and grow in a rosette form, but that’s where the similarity ends. Aloes are Old World plants from South Africa, Madagascar, the Saudi peninsula, and the Mediterranean region. Agaves are New World plants from the Americas. Aloes vary in color from grey to bright-green and are sometimes striped or mottled. Some Aloes native to South Africa are arborescent (treelike). Of the more than 500 species of Aloe, only a few have been used traditionally as an herbal medicine. Aloe vera is the most commonly used Aloe in herbal medicine. The Greeks and Romans used Aloe vera to treat wounds. In the Middle Ages, the yellowish liquid found inside the leaves was favored as a purgative. Unprocessed aloe that contains aloin is generally used as a laxative, whereas processed Aloe vera juice does not usually contain significant aloin.